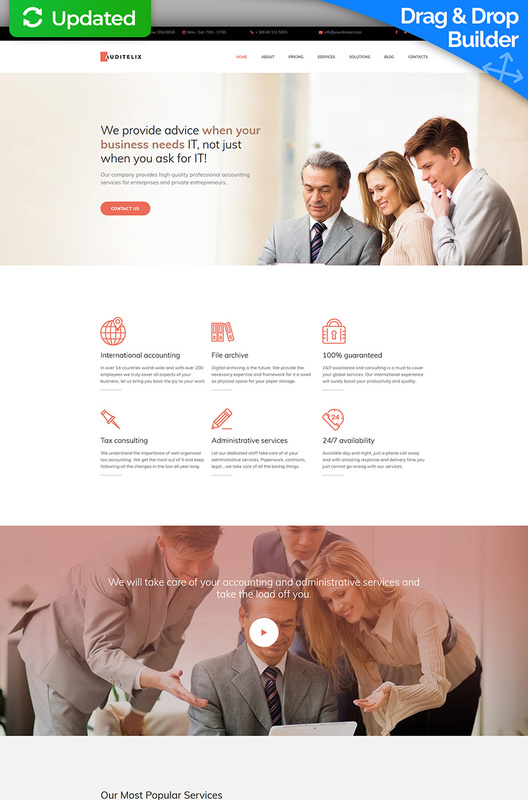 Robust and visually flawless, this responsive Moto CMS 3 template for accounting businesses has a contemporary minimalist design, which will bring your corporate website to a new level of professionalism. It is easy to customize, and even easier to maintain thanks to the visual drag & drop page builder jam-packed with content modules for any occasion. For those who can't imagine their business workflow without marketing, a well-designed blog layout and conversion-optimized newsletter subscription forms were added. It is also worth mentioning that the typography of this template is based on the rich collection of Google Web Fonts, which provide even more possibilities in customizing its design. Love the template and selection of Template Monster. Also the service support at MotoCMS is awesome. Those guys went above and beyond my expectations setting up my website.